The billionaire wondered what to buy next. It was difficult for the billionaire to spend money, more difficult than he thought it would be. He was a famous billionaire because he actually had a billion dollars – the money wasn’t invested anywhere; there were no stock options, no trust funds, no hedge funds. He wouldn’t have had a hedge fund anyway. That sort of thing sounded too much like someone could trim his money away, into the shape of a duck. Taking his money out of investments was the last hard and fast decision the billionaire had made, and that was a long time ago. When he went out to buy things, people recognized him and gave him whatever he was buying for free. They knew he was good for it, or something silly like that. He went to buy a t-shirt and when he went to go for his wallet, the clerks always stopped him and didn’t make him pay. From a business standpoint, maybe this was sound, though. Maybe all the other billionaires would follow his example. He didn’t know: he didn’t have any billionaire friends to ask. He had some millionaire friends, sort of… at least, he went to their parties when he was invited. But it was always awkward, because he would stand to the side and no one would really talk to him, and he wouldn’t know what to talk about anyway. Days slipped by the billionaire all the time, without him noticing. He wondered how Bruce Wayne did it – Wayne was a billionaire, and he seemed to always be busy with supermodels and training and inventing Batman things and then, at night, being Batman, plus he ran that business or at least went to some meetings… that all seemed terrible to the billionaire. Instead, he just wandered about his mansion, looking out on the nicely manicured lawn and thinking about things he wanted to buy, if there were any left. When the billionaire was a kid, he didn’t want to be a billionaire. The “I want to be rich” thought never crossed his mind. He never knew what he wanted to be, except for the vague notion that maybe he could be a carnival ride operator. He would watch the guy with the tattoos at the county fair pull on the levers and press the buttons and then, the kid that became a billionaire would watch the people come off the ride happy, and he thought: There it is. That’s the job for me. He sort of forgot about that, though, and instead he invented that thing that made the machines that makes machines a little bit faster, and he sold it away, and instead of paying off his car and paying for a nice trip to Alaska for salmon fishing, like he wanted, it turned out it was worth a lot more than that and he ended up with this big giant house and all of those cars that were given to him for some reason, and the hammerhead shark shaped pool, and he wanted a helipad but didn’t want to take the lessons for it. The billionaire wanted to go out and buy something, though. He put his hands in the pockets of his khaki chinos and put on the sunglasses that cost two grand or something, and he went outside and walked all the way down his manor and into the street and all the way into town. “I’d like buy a candy bar,” and the man scurried off and shouted from inside the little shop, “What kind do you want?” and the billionaire didn’t answer right away because he couldn’t remember the name of the one that had wafers and nuts and caramel in it, so the gas station attendant came back out with an armful of candy. This isn’t what I wanted, the billionaire thought as chocolate bars melted in his pocket and he chewed a piece of gum. Is gum candy? The billionaire wasn’t sure. None of this is what I wanted. How did this all happen? Why didn’t I get married? Wasn’t there a girl back there who wanted me to marry her, and not because of my money? Was there a reason I went on this walk? He thought about reaching for his cell phone and calling someone to bring his car over, so he could go home, but he didn’t. He kept walking on and forgot that he wanted to spend his money. He noticed that there was a couple rides set up in a park and he headed that way, stuffing the empty wrapper for the gum in his pocket and choosing a chocolate bar with nougat. There was a man pulling the levers with tattoos on his arm for a sky bucket ride, and the billionaire watched no one get on for a long time. No one wanted to ride the sky buckets, but the tattooed operator was sending the little multi-colored carts anyway. How much does one of those cost? The billionaire thought. He looked at the tattoos on the operators arm. Couldn’t be more than a thousand, he thought. What would I get? “You want a ride?” The operator asked. “No,” the billionaire answered, “thanks.” He was scared of heights. Another reason why Bruce Wayne is insane. He was always jumping off buildings, even though he couldn’t even fly. The billionaire went and laid down underneath the sky bucket ride and watched the empty buckets go by. He tried to remember what he wanted to be, and couldn’t, and he couldn’t think of anything he wanted to be now that he could do anything. He pulled another candy bar from his pocket and let the day drift away. Posted on Sunday July 11th, 2010 Wednesday March 26th, 2014 by Max Elman. 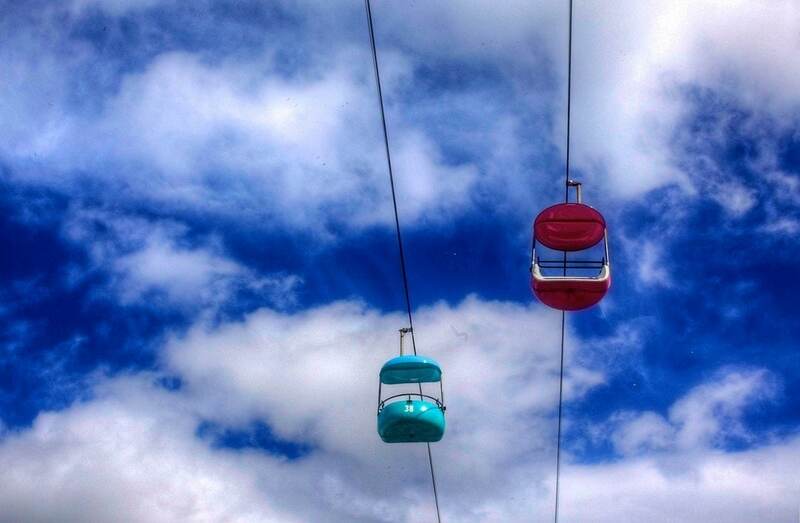 This entry was posted in Photos & Stories and tagged blue, santa cruz, sky. Bookmark the permalink.